SKU: S1. Category: Uncategorized. Tag: all terrain skates. From the Manufacturer: Skiking is a new and exciting activity for just about everyone. 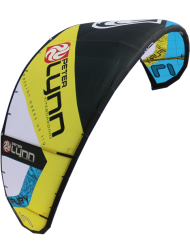 If you are in to cross country snow skiiing, inline skating or roller skiing, you’ll feel at home on a pair of Skikes, with better adaptability and control over many off-road surfaces. Skikes are a mix between ski rollers and inline skates and have the terrain advantages that mountain bikes offer. They have effective brakes and pneumatic tires. The result is a safe and stable off-road adventure. A Skike is a sports device consisting of two wheels attached to a frame that can be strapped onto the rider’s shoe. 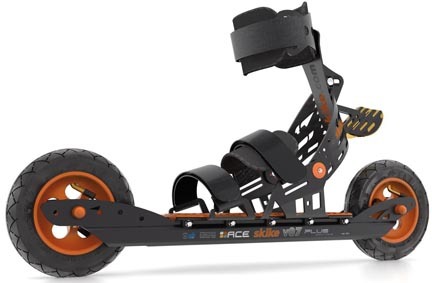 Similarly to roller skis, Skike has one wheel at the front and one at the rear of an aluminum frame that can be attached to the foot. However, unlike roller skis and roller skates the tires are pneumatic. So in addition to hard flat surfaces like concrete or asphalt, Skikes can also be used on rougher terrain such as dirt roads, grass and gravel. The Skike straps onto the rider’s shoe, and does not require any special type of boot. It has a brake on the heel that allows the rider to stop or brake gradually by pushing back with the lower legs. The Skike rider moves forward in a skating motion, usually with poles, similarly to normal cross country skate skiing. Skike gives great all-round exercise similar to cross-country roller skiing, but with the benefits of being able to brake easily and utilize more varied type of terrain. Unlike on the roller skates and inline skates, Skikes use a pair of large 5.9″ (15cm) rims with inflatable tires – that’s where the “bike” part comes in. They’re also considerably longer than your foot, with the wheels placed at the very front and very back, connected by a lightweight aluminum frame. Instead of the full shoe of other skate designs, Skike’s design is more open and light, using a series of three straps to secure your foot to frame, and a powerful braking system providing real stopping power. They’re designed to be used for on-road and off-road applications (think smooth paths). The skates are designed to be used with poles in a warm-weather version of cross country/Nordic skiing. With Skike, 90 percent of your muscle are engaged, providing a fun, and complete workout. The pneumatic tires offer an excellent road adherence as well as tracking stability and effective braking components. Because of the pneumatic tires, Skikes are excellent for off-road courses such as wooded areas and rocky or rough terrains. The long wheel base of these inline type skates allows for cross-skating with ease. The brakes are easy to use and highly effective in slowing or stopping. They are activated by pushing the calf backward very softly. The certified brake action is 6.5 m/s², which is the same as that of a high quality bicycle. Skikes do not have built-in shoes as do many outdoor sports equipment. You can wear whatever shoes you feel are most comfortable, although many use hiking boots when skiking. If you plan to be out for long periods, hiking boots will come in handy in areas of less than perfect terrain.